is the slogan of the modern city that CIAM (International Congresses of Modern Architecture) proposed as Athens Charter in 1933. The original story is the concept of Le Corbusier’s “Radiant city” / “Ville Radieuse”. There is something that is missing in this slogan. Isozaki Arata points out that it is <Soil> (“Sumika 12,” “The Final Home” Library Publishing Bureau of Housing, 1999). The beginning of architecture is a simple cabin with triangle roofs (pediments) passed over four trees (pillars) in the forest. It is called “primitive hut”. It is an inscription published in Father Roje’s “Architectural Essay” (1753). Architecture started with people living in a simple structure on <Soil>. The modern age is the time when it’s impossible to live in <Soil>. Hitler made the slogan “Blood and Soil” as an attempt to restore it. “Spatialism” remained after the ideology of <Soil / Geopraphism> was defeated in the Second World War. Isozaki preaches the emergence of the metropolis and globalization spurred the victory of “Spatialism”. The building symbolizing the loss of <Soil> and the victory of “Spatialism“ is realized by Mies van der Rohe, not Le Corbusier. It is Lakeshore Drive Apartment. The 26-story glass twin tower built on the shore of Michigan in Chicago is a three-dimensional lattice that has been separated from <Soil> and lost its location. living in a suspended condition. Place where lost the uniqueness of not being anywhere and being somewhere. It was a conclusion that Isozaki arrived at the end of the 20th century. This is the reality of cities in the world. 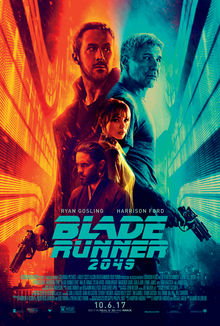 The movie ” Blade Runner 2049 ” (Duni · Villeneuve, 2017) draw the world that will come after the victory of this “Spatialism” . Let’s read “Blade Runner 2049” as a theory of the city. In the previous slogan of “sun, green and space”, <Soil> has already been truncated, However the green that covers the <Soil> and sun is still left. ” Blade runner 2049 ” is in the world where the environment is destructed and the ecosystem corruption is progressed. In addition to that, both the sun and the green were lost. Due to climate change, the earth is always covered with cloudy skies, acid rain has fallen, snow and storms are in a normal state. Food is cultivated in a culture solution rather than <large land>. Food is produced in a facility like a factory called a synthetic farm. Lots of land are lost due to the sea level rise, and the remaining land has become a wasteland where the breath of life has been lost. Several cities near the Los Angeles have already been abandoned. San Diego has become a mountain of garbage at the waste disposal site, and Las Vegas is a desertified ruin. Lost is not only <Soil>, the sun and green. <Architecture> also loses its outline. In the movie ‘Blade Runner’ (Director Ridley Scott, 1982), the future image of Los Angeles. The city turned into an Asian chaos, acid rain do not stop. It was shocking. This basic style has been succeeded also in this work. Barely discernible by the reflection of neon, the facade are already covered with miscellaneous billboards and electronic advertisements. A street corner presenting aspects of chaos reminiscent of Hong Kong, Tokyo or Bazaar in the Middle East. A street full of people wearing costumes of all ages and places. 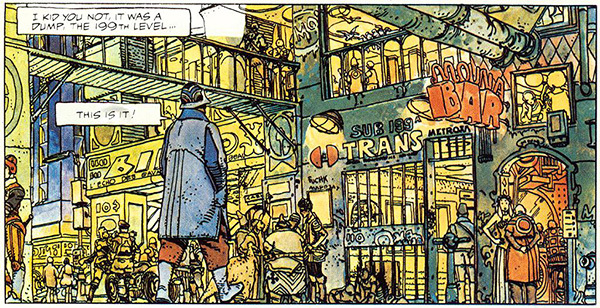 The image of future city as chaotic wearing this old-fashioned design comes from the short story “The Long Tomorrow” of French band-decineman Mobius (John · Jiro), which Ridley Scott liked. Is known. It is a work of Philippe Marlowe detective story in chaotic future city. By the way, the original author of “The Long Tomorrow” is Dan O’Bonnon, a screenwriter of the movie “Alien”, and it was the film of Alejandro Hodrovski’s “planet of Dune sand” that got the chance to connect these two people . Ridley Scott invited Sid Meade (designer at Ford motor company) to embody its visual image. Sid also handled the image of the ruined Las Vegas described later in ” Blade Runner 2049 “. Even the three-dimensional lattice of the 20th century is covered with darkness and acid rain and loses its outline. Compared to the strong impact of buildings such as solar panels filling the city with tidal banks like gigantic dams and spinners (flight automobiles) occupying the roof of buildings, the image of <architecture> It’s too dilute. <Architecture> no longer plays a role symbolizing <city>. Interior is visualized carefully in the movie Blade runner 2049. It is the loss of <architecture>. The synthetic farm is where the old type replicant hides. Building like an shelter building, However the interior is set as an interior of old farm. Aged leather sofas are placed, in the kitchen there is steam from an old-fashioned iron pot. The apartment where the hero’s K (Ryan · Gosling) lives is drawn only inside. In the blatant interior, the wall of the kitchen imitating Maya’s design. Also a concrete design block used at Ennis / Brown’s house in Frank Lloyd Wright’s building appears. That visual also appeared in “Blade Runner”. The casino hotel in Las Vegas where Rick Deckard (Harrison Ford), the main character of the previous work, is secluded is high light. The city of Las Vegas is said to be at the hypocenter (this work has a prologue that a high altitude nuclear bomb exploded by replicant rebellion in 2022) is polluted by radioactivity and ruined, like an orange haze It has become a desertified place taken. The appearance of the hotel is almost neglected (it is barely a building like the solid curtain wall of the glass curtain wall barely), and it is an old-fashioned interior where elegant style such as classical style, Art Deco is compatible. As a favorite of Deckard, Presley, Marilyn Monroe and Frank Sinatra ‘s follow – up also appear meaningfully. The future is a recursive past, it is the basic concept that continues from “Blade Runner”, but what exactly does a nostalgic interior mean?